Having spare time but boring in room? 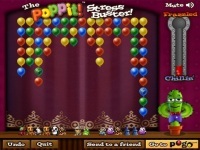 Try playing poppit! The easygoing game packed in flash format makes it small in file size but quite comfortable to play on. The target is just easy: pop 3 or more contiguous balloons with the same color until the area is clear. Collect great bonus and combos with no doubt and feel happiness through the gameplay.